The Waterex system is a new state of the art water-generating machine, that transforms the humidity in the air into pure drinking water by using the latest and most sophisticated technology, while using the minimum amount of electricity. 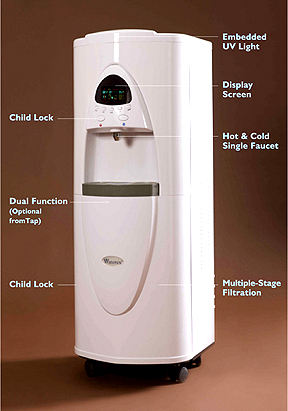 The Waterex system grantees pure drinking water from the humidity in the air and is perfect for your home or office. No more going to the store and carrying heavy jugs of water or relying on strangers to bring it into your home. So whether you presently purchase bottled water from the store or have it delivered to you, YOU ARE SIMPLY PAYING TOO MUCH! The system can produce up to 20 liters of water in a 24hr period, at 85% humidity and 30 degrees C, and it can store up to 18 liters thus ensuring that there will be enough water than needed on an average day. (The unit performs better in more humid & warm conditions). The multiple stage filtration systems ensures the purest drinking water free of chemicals (e.g chlorine etc) by using ‘Reverse Osmosis’ membrane technology and ‘Ultra Violet’ filters, while the Electrostatic Air Filter is cleaning the air in your home or office. The unit is about the size of a typical water dispenser and has a digital view window where you can monitor the humidity, the condensation operation, water temp and water levels. Visit any of our four(4) showrooms to see the system and taste the difference!